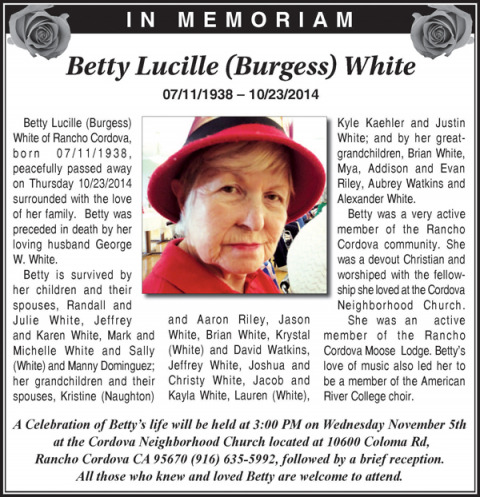 Betty Lucille (Burgess) White of Rancho Cordova, born 07/11/1938, peacefully passed away on Thursday 10/23/2014 surrounded with the love of her family. Betty was preceded in death by her loving husband George W. White. Betty is survived by her children and their spouses, Randall and Julie White, Jeffrey and Karen White, Mark and Michelle White and Sally (White) and Manny Dominguez; her grandchildren and their spouses, Kristine (Naughton) and Aaron Riley, Jason White, Brian White, Krystal (White) and David Watkins, Jeffrey White, Joshua and Christy White, Jacob and Kayla White, Lauren (White), Kyle Kaehler and Justin White; and by her great-grandchildren, Brian White, Mya, Addison and Evan Riley, Aubrey Watkins and Alexander White. Betty was a very active member of the Rancho Cordova community. She was a devout Christian and worshiped with the fellow-ship she loved at the Cordova Neighborhood Church. She was an active member of the Rancho Cordova Moose Lodge. Betty’s love of music also led her to be a member of the American River College choir.